If we take a look at some books about rabbits (and hare), there are so many types of rabbits or breeds that we know to date. In general, we can say there are two big categories of rabbits: free rabbits and domestic rabbits, in which the pet rabbits are belong to. Two pictures below show you the contract between both. A free rabbit was freely eating grasses and flowers in the savanna, while my rabbit Pucca, a domestic rabbit was exploring the front yard. Lionhead, Holland Lop, Netherland Dwarf, Polish, Polish Dwarf, Dwarf Hotot, Jersey Wooly, etc. Dutch, American Fuzzy Lop, Mini Lop, Dwarf Lop, Himalayan, Mini Rex, etc. Chinchilla, English Angora, French Angora, Rex, Belgian Hare, etc. English Lop, Satin, Californian, New Zealand White, etc. French Lop, Flemish Giant, British Giant, Checkered Giant, etc. 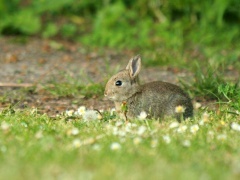 Beside dwarf, S-M-L and giant size of rabbits, also known some types of mini rabbits. They are called mini because they are similar to original types except the size that smaller or much smaller. For example Mini Rex is Rex rabbit that smaller in size, and Mini Lop is miniature of typical Lop rabbit. Some breeds have very unique sign so we will recognize them at a glance. The Angora is appealing of its long and wooly hair like Angora cat. The opposite is the Rex rabbit who has very short hair with unique soft velvet-like fur. And you will know it’s a Lop when you see the rabbit with distinctive floppy ears. The Dutch rabbit has unique color pattern like panda bear. What is Your Favorite Type of Rabbit? Do you have a pet rabbit? Share with us what is your favorite type/breed. Your description will appear on a Web page exactly the way you enter it here. You can wrap a word in square brackets to make it appear bold. 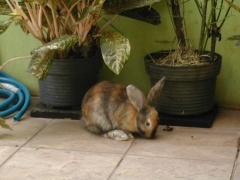 For example [my rabbit] would show as my rabbit on the Web page. Tip: Since most people scan Web pages, include the most interesting about the rabbit in your first paragraph. Don't have one yet. Where can I get me one? She's a brown rabbit with black stripes. What type of rabbit is she? Oh, and her ears is pointed down. Ginger spots with a ginger stripe down his back. Funny, quick ,likes to play with cats knows where his cage is. Small, white with black spots long floppy ears and told to weight approximately five pounds. Very calm and sweet. Pushes with nose alot. I have mini rex. He is a buck, loves to chew. I have a pet Netherlands dwarf rabbit named Remi and he loves water and people. My bun is the sweetest EVER! He is 8 mo. old, and loves to play, jump, and lick my face! Love him! Rowdy is the cutest bun! Very happy and playful. He has captured all our hearts! I have a dwarf rabbit her name is Pepsi, she is white and grey and has big brown eyes! I have five rabbits, in which three are "blackinwhite", one full "white" and one is "browninwhite". I have 1 sooooooooooooo cute. He's white with gray with ruby red eyes. My rabbit is called Marnie and is 10 weeks old. She loves to play and is friendly. It has long ears and can "talk". He is white with dark brownish gold spots, one ear is completely dark brown and his eyes are dark brown!